Here's How You Can Dive Inside The Top-Secret Files Of An eBook Marketing Wizard, and 'Steal' His Very Best Strategies For Pumping Out Money-Making eBooks In Record Time! This is great news for you, because you can take advantage of all my hard work! You now have a chance to learn all my hard-won secrets of creating eBooks that really make money. But it doesn't stop there, you'll also learn how to market them online, drive tons of targeted traffic to your website, and earn a very comfortable living online. Imagine how great it'll feel to wake up in the morning, check your email, and see that while you were sleeping... your "simple little website" was actually making money for you! It's a great feeling, I tell you! A global market: all you need is a computer, a phone line, and Internet access to reach millions world-wide, eager to pay for information you provide. "How To Write, Publish and Promote Your Own Profitable eBook" will give you complete instructions on how to create your own online business, and will teach you successful techniques for promoting it. Think of it as a complete online course for entrepreneurs interested in earning more income. Important: this eBook is NOT a lot of things. It is NOT a method of slapping together a poor-quality product in a day or two (this method is NOT recommended if you want to maintain credibility online). It is NOT for those who aren’t willing to put some work, effort and time into creating their eBook (although I will teach you shortcuts and easier methods of putting it together and marketing it). Contrary to much of the hype out there, creating a great eBook that offers solid information and advice does take time and research. But the results are more than worth it. 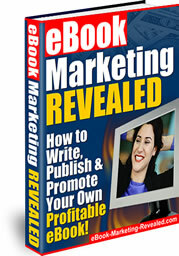 By investing some effort into writing your eBook, you will see a return on your investment over and over and over again. Best of all, you’ll avoid the mistake that most people writing eBooks make: they don’t research what will sell. It is NOT just another hasty compilation of recycled articles disguised as information with a bunch of affiliate links . I don’t work that way. Instead, it's a real educational course (180 pages of amazing secrets, and time saving shortcuts), packed with real, usable, practical advice that you can start using right away. You’ll be mentored through each step as I show you exactly how it’s done, from finding my initial topic, to outlining the chapters, to researching the book. I didn’t leave any part of the process out, and cover each part in detail.